Kuih dadar or kuih tayap is a rolled crepe flavored with pandan juice and filled with grated coconut steeped in gula melaka or Malaysian palm sugar. Combine the pandan leaf and water in an electronic blender and blend for a minute. 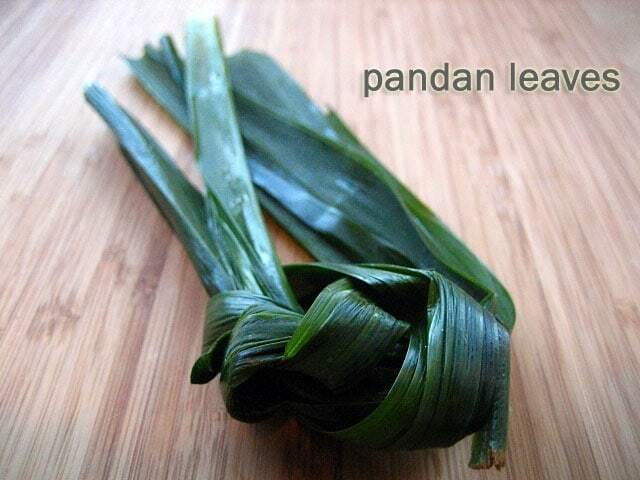 Wrap the pandan in a cheese cloth or muslin cloth and squeeze to extract the juice or strain through a fine sieve. Set aside. Sieve the flour into a mixing bowl. Make a well in the center and crack in the egg. Slowly stir in the salted coconut milk and 3 tablespoons pandan juice. Set aside. Break up the palm sugar and combine with the sugar, pandan leaf and water in a pot. Cover over a medium flame until sugar dissolves. Strain the syrup and return it to the pot. Add in the grated coconut and corn starch and continue to cook for a few minutes. Dish out into a bowl. Heat up a shallow frying pan over a low flame and grease lightly with oil. Pour 2 tablespoons of the batter in the center and swirl the pan to coat it form a thin crepe of about 13 cm in diameter. When the crepe is cooked, transfer it onto a chopping board. Place 2 heaped teaspoons of filing on the crepe and roll it up like a spring roll.